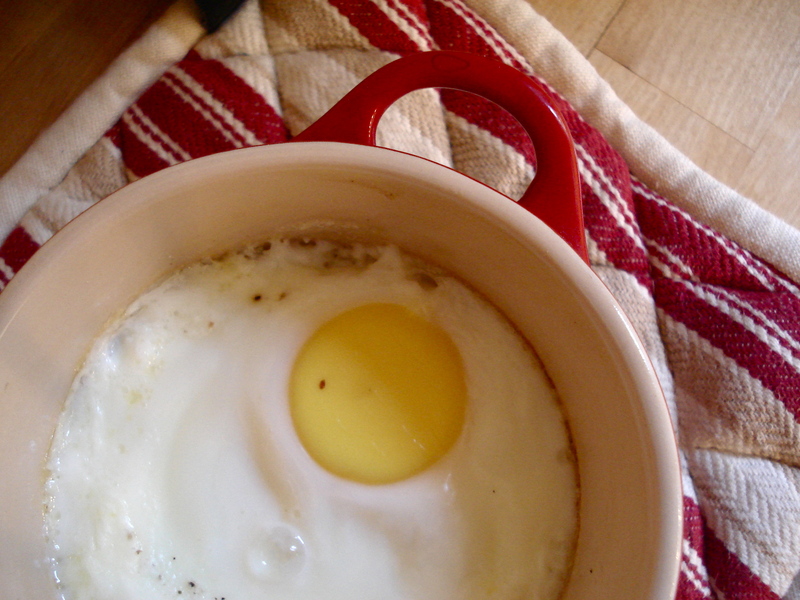 Oeufs cocotte are eggs baked in small ramekins. Before trying my hand at them, I had eaten three French-style baked eggs in my life. Two of them were among the best dishes I have ever tasted. The first was at the Auld Alliance bed and breakfast in the Cairngorms National Park in Scotland (the chef was French and trained in French cuisine). The second was in New York at the French bistro Artisanal. Ironically, the third was actually in France, but not my favorite. The egg wasn’t cooked enough for my tastes, as has been the case of every single egg I have ever ordered in a restaurant in France! I admit I’m a little picky: I don’t like the white to be the least bit slimy; the yolk can run (I love that actually and am disappointed when I overcook it), but the white must be fully cooked. We’ve been eating eggs lately and I was beginning to get bored. So, I decided to try making (for starters) a simple version of oeufs cocotte. In the restaurants, they’ve always been fancier, with spinach, mushrooms – wonderful ingredients to marry with eggs. For my first try, I opted to go easy: just eggs. It was a success and now I’m scheming my next (more challenging) batch of baked eggs. 1. Coat the bottom of the ramekins with some butter. 2. Spread a thin layer of cream over the bottom (about a spoonful). 3. Crack the eggs (careful not to break them). 4. Add a splash of milk (this keeps from drying out). 5. Sprinkle with salt and pepper. 6. Bake at 200°C (400°F) until the eggs are cooked as you desire (keep a close eye on them). What should I try adding to my next batch? This entry was posted in Recipes (All), Recipes (Gluten-free) and tagged brunch, mains, New York, restaurants, scotland, travel. Bookmark the permalink. Going to have one today. Thanks for this knowledge on how to cook my egg, I was not sure how to do it. yay! I was just thinking about baking eggs and i think i will go ahead and try them this week!